DI PRO subscribers can now see which strings appear most often in new gTLD registries’ block-lists and search for strings — such as trademarks or premium strings — that interest them. We’ve just launched the New gTLD Collisions Database. Currently, it indexes all 30,581 unique strings that ICANN has told the first 18 new gTLD registries to block — due to the risk of collisions with internal networks — when they launch. 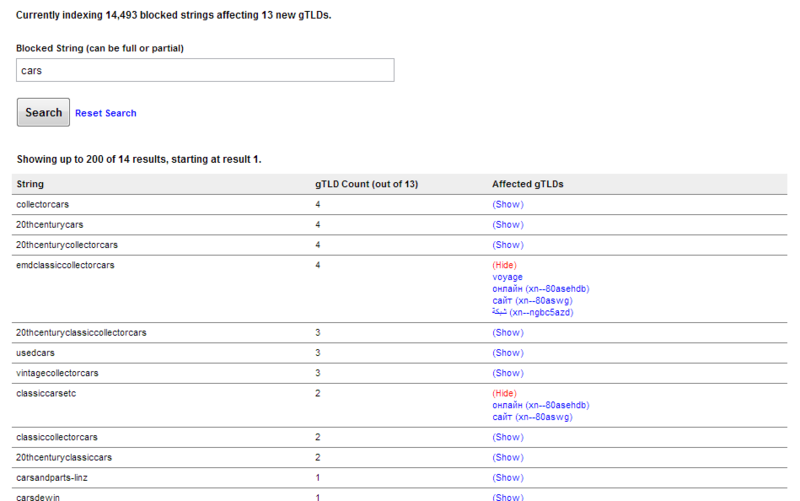 By default the strings are ranked by how many gTLDs have been told to block them. You’ll see immediately that “www” is currently blocked in all 18 registries, suggesting that it’s likely to be blocked in the vast majority of new gTLDs. Users can also search for a string in order to see how many, and which, new gTLDs are going to have to block it. We’re hoping that the service will prove useful to trademark owners that want to see which “freebie” blocked strings they stand to benefit from, and in which gTLDs. The service will also hopefully be useful to registries that want to predict which strings ICANN may tell them to block. We’re seeing a lot of gambling terms showing up in non-gambling TLDs, for example. Here’s a screenshot of sample output for the search “cars”. As ICANN publishes lists for more gTLDs, the database will grow and become more useful and time-saving. This content is available to DI PRO subscribers only. While we’ve added several smaller requested features to the DI PRO New gTLD Application Tracker over the last few months, the time has come for the second big update to the service. Subscribers have asked for a number of changes and upgrades to make it easier to quickly get at the data they need, and we’re happy to oblige. The Application Tracker, has been updated in three areas. Talking to subscribers over the last few weeks, it became clear that different people are using the Application Tracker in different ways for different reasons. Some want to be able to find out if, for example, an application has ever been objected to or received GAC advice, while others only want to know whether those objections and advice are still active. From today, both use cases are made easier with the introduction of a new Current Status tab. Searches conducted under this tab automatically filter out all withdrawn and rejected applications. If a contention set has been won, the winner will not display as contested in results. Similarly, if an application managed to fight its way through objections or GAC advice, it will show as unopposed and unencumbered in search results pages. Subscribers who want to carry on using the service to access historical information about applications can continue to use the previous version of the Application Tracker under the new “Original Status” tab. The existing IE Results database has been folded into the Application Tracker under a new tab, and there’s also a new option to see the full scores for each application that has passed through Initial Evaluation. The Basic tab shows the financial and technical evaluation subtotals along with other information about the applicant and back-end provider. With ICANN’s publication of Interilse Consulting’s report into the potential security risks of new gTLDs last week, each string was assigned a risk profile: Low, High or Uncalculated. The database was updated with this information the same day it was published, but now you can search on it too, choosing to limit your search to, or omit, any of the three classes. You can now also search for, or exclude, applications that have been rejected by ICANN. There are only three such applications right now, but I’m sure this option will become more useful in future. 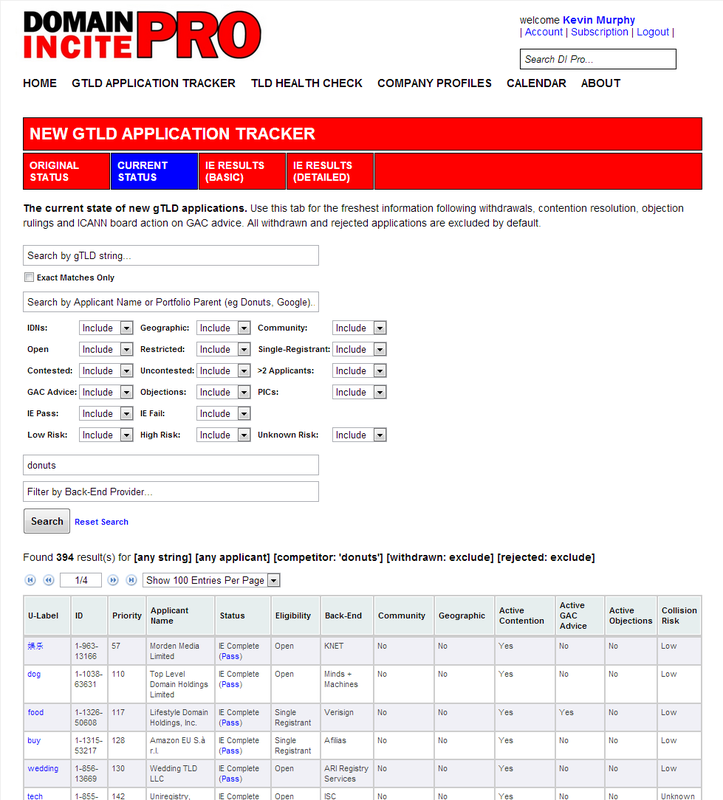 For details of all the original features of the Application Tracker, see this April blog post. For DI PRO subscription information, click here. Subscribers can send suggestions for future updates to kevin@domainincite.com, as always. Today DI PRO is launching a new live dashboard for new gTLD program statistics. The idea is to give users quick and easy access to key program metrics. Want to know the maximum number of gTLDs that can be delegated in the current round? It’s 1,365. Want to know how many contention sets remain? It’s 222. Want to know how many how many applications have failed Initial Evaluation? It’s 4. While almost all of this data has been easily accessible via the DI PRO New gTLD Application Tracker for months, the new Live Stats interface provides a quicker, at-a-glance view. All the stats are generated live from the DI PRO database, which is updated at least once a day with the current status of all 1,930 new gTLD applications. New IE results are added Fridays at 8pm UTC. What’s more, users can drill down into detailed search results by clicking the stat they’re interested in. User previews have been positive, but we’re always open to suggestions if there’s a stat you’d like to see included. Subscribers can check it out here: Live New gTLD Stats. Today, DI PRO introduces a new search tool that enables you to easily view, search and sort Initial Evaluation scores from a single page. The tool, available here, is designed for users who desire a little more granular data on IE results than currently displayed on the New gTLD Application Tracker. Users can see financial, technical and total evaluation scores for each application that has been processed through IE (currently 244 applications) in the same sortable table. Results can be filtered by string, applicant and back-end registry services provider. New scores will be added every Friday night (or Saturday morning, depending on the timing of ICANN’s results publication) until Initial Evaluation ends. UPDATE MAY 14: The tool now also lists the date the results were published, enabling users to see which applicants are failing to immediately pass according to their prioritization number. ICANN’s Governmental Advisory Committee published its Advice on New gTLDs during ICANN’s 46th public meeting, held in Beijing April 7-11, 2013. The Advice, found in the Beijing Communique, is far-reaching and, initial reactions suggest, goes a long way to attempt to redefine several key assumptions new gTLD applicants had made about the program. There are five broad categories of Advice on New gTLDs contained within the Beijing Communique. Overall, 517 unique applications are affected, according to DI’s analysis. This page attempts to present a comprehensive list of these applications, with a brief summary of each Advice type. DI PRO subscribers can read the list here. Download our FREE 15-minute white paper, New gTLDs in your coffee break.